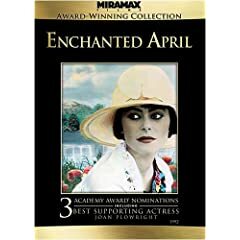 Burbank, California, February 20, 2009 – Two proper Englishwomen find romance, hope and renewal in the Italian countryside when Enchanted April makes its highly anticipated DVD debut on May 5, 2009 from Miramax Films. Enchanted April’s breathtaking scenery and charming story make it the perfect movie for anyone who has ever dreamed of an unhurried sojourn in Italy. The DVD includes audio commentary by the director and producer. Josie Lawrence (Eastenders) and Miranda Richardson (Harry Potter and the Goblet of Fire) head a stellar ensemble that also includes Joan Plowright (The Spiderwick Chronicles), Polly Walker (Cane), Alfred Molina (Spiderman 2) and Oscar-winner Jim Broadbent (Best Supporting Actor, Iris, 2001). Gorgeous visuals and top-notch acting, directing and writing made Enchanted April an international hit and earned the film three 1992 Oscar nominations including Best Adapted Screenplay for screenwriter Peter Barnes, Best Supporting Actress for Plowright and Best Costume Design for Sheena Napier. In addition, the film received two Golden Globes, one for Richardson (Best Performance by an Actress in a Motion Picture – Comedy or Musical) and one for Plowright (Best Performance by an Actress in a Supporting Role) and was nominated for Best Motion Picture, Comedy or Musical. them. Gorgeously photographed and superbly acted, Enchanted April is like taking a little mini-trip to a sunny Italian paradise. below. Last date for entries is May 6, 2009.